Proper ventilation for cooking appliances is very important for indoor air quality. The range hood should ventilate to the outside and not simply recirculate and attempt to filter the cooking fumes. This is especially important with gas ranges. Whether you choose a conventional updraft hood or a downdraft hood can make a big difference in the amount of air that has to be heated or cooled to maintain comfort in the house: downdraft fans require several times more air than updraft models. Also be careful about the size of the fan — too large a fan can waste energy and possibly even pose a safety risk. When a ventilation fan is operated, it depressurizes, or creates a slight vacuum in the house. To balance that pressure difference, outside air is sucked in through cracks in the walls and around windows (infiltration). That makes your heating system work harder, wasting energy. In some situations, that negative pressure can even prevent an oil or gas heating system from venting properly, causing back-drafting of dangerous combustion gases into the house. 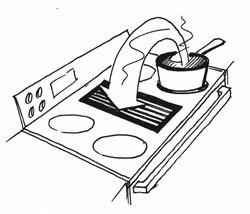 This latter concern is especially serious with the large downdraft ventilation fans used with some cooktops and ranges. Ask about make-up air ducts for these ventilation systems. 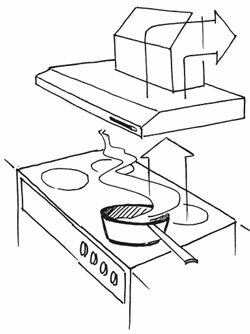 Clearly, downdraft range hoods require many extra steps to work safely because of the large airflow required. This makes them both less efficient and more expensive. If you have a gas stove, use a range hood that vents to the outside.